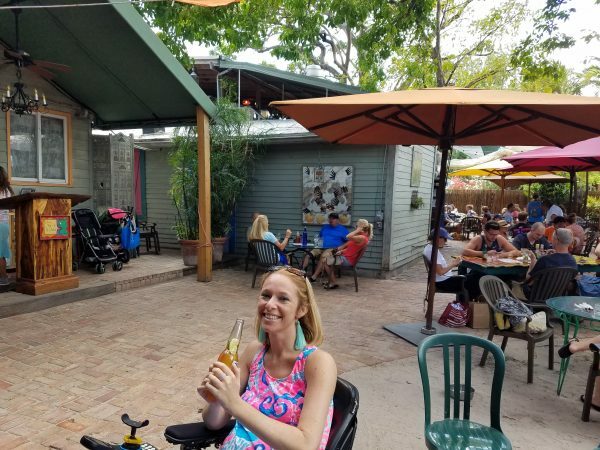 Since I am an avid researcher I immediately started looking into all of our options that would allow us to go somewhere where I could take both my manual chair and power chair. I suffer from a lot of physical injuries that prevent me from pushing my manual chair as a complete C6 quadriplegic. 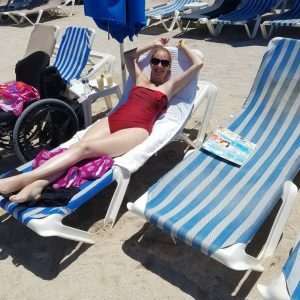 I am more than happy to sit in my manual chair for eight hours at a time, but after that I am just more comfortable in my power chair as I don’t have to be pushed, and I have the freedom to go where I want. 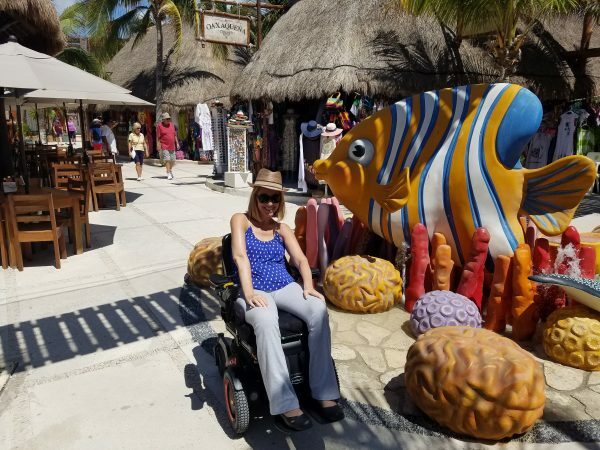 This made my quest for researching a vacation slightly limited as I did not want to hop on a plane yet and check in both my manual and power chair. I had done this once before when I moved to China many years ago, and let me tell you it was anything but fun! I have always had a stigma against cruise ships because growing up on a small out island in the Bahamas I would always see cruise ships passing by, and I could not possibly fathom the concept of being stuck on a large ship with thousands of passengers. However, I decided to put my fears aside and give it a go. We chose one of the smaller ships on Royal Caribbean called the Rhapsody of the Seas with 2,900 passengers. It’s hard to believe that this was one of their smaller ships actually! 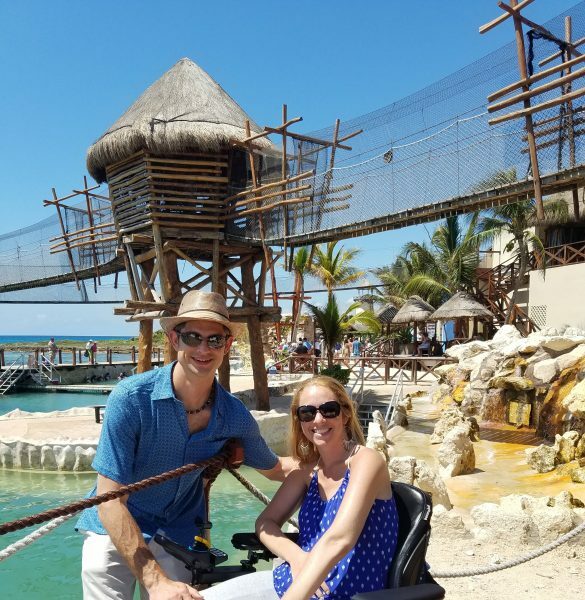 What I was really looking for was being able to participate in some of the excursions off of the ship and experiment how handicap accessible they would be. 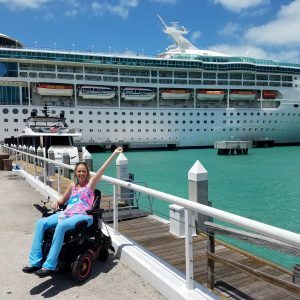 I learned that most of the shore excursions that Royal Caribbean provide are not actually handicap accessible except if you just want to get off the ship, and just roll around that particular city. I wanted to do something adventurous and rugged. With seven days on the ship we had four days of shore excursions including Key West, Florida; Cozumel, Mexico; Belize City, Belize; and Costa, Mexico. I didn’t want to plan an excursion on every single one of these days as I was not sure how my body would handle too many outings. 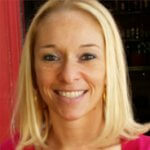 One challenge I have as compared to many is my skin. I am literally like the “Princess and the Pee” in regards to getting a pressure sore at the drop of a hat. 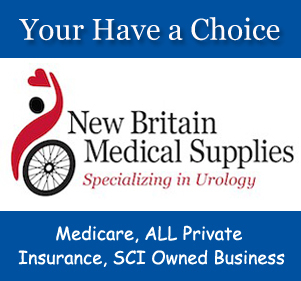 Generally, I find that most spinal cord injury patients have one or two medical issues that constantly resurface for them such as pneumonia, constant urinary tract infections, pressure sores, respiratory infections, spasticity, etc. For me it is osteoporosis and pressure sores. I have to be very careful not to break a bone and if I don’t sit properly in my wheelchair or have any kind of wrinkles in my clothing I am pretty much a goner with respect to getting some sort of pressure sore. 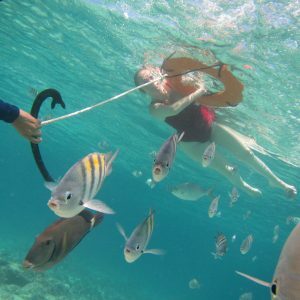 With all this in mind I set out to figure out how I could snorkel in the ocean in Mexico, and explore some of the Mayan ruins in Belize, which was on the top of my boyfriend’s list of things to do. 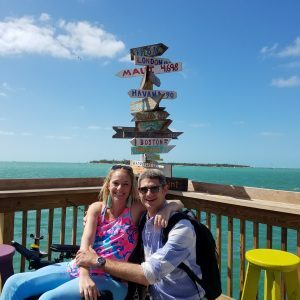 I found two separate companies that offered “handicap accessible” excursions, and I use this word quite loosely as handicap accessible definitions in foreign countries are definitely not the same as in the United States  I knew I was going to have to take my manual chair on the day excursions and my extremely strong boyfriend would have to lift me up wherever I needed to go. What we learned and experienced was nothing short of slightly terrifying. 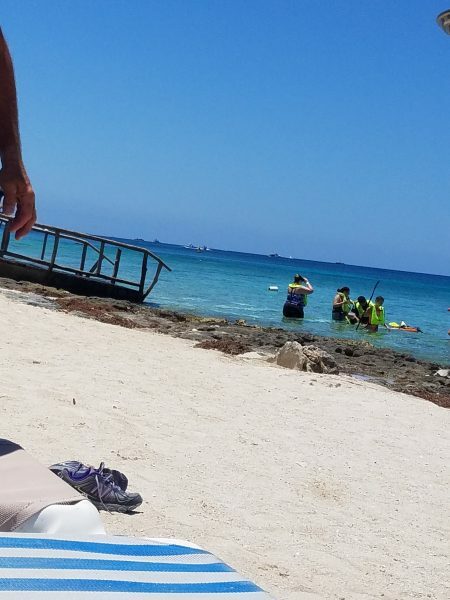 We did find a company called Cruise Planners that offers an excursion to handicap accessible folks to go snorkeling on the beach. 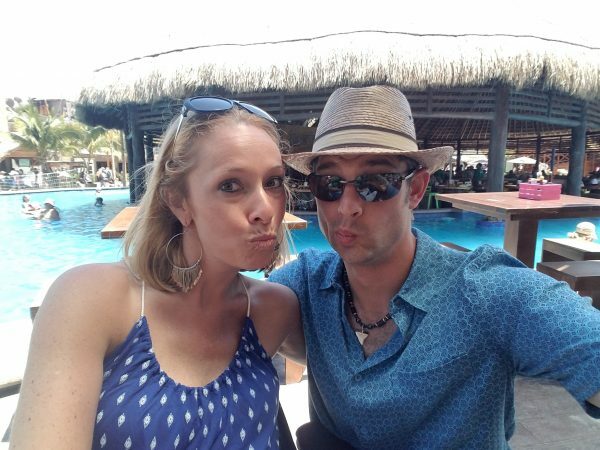 I naturally jumped at this opportunity and when we got to Mexico we were loaded into a pretty decent handicap van. When we arrived to the beach the entrance into the water was covered with rocks and we were going to have to carry me hundreds of yards over a slippery type dock to get me into the choppy water. 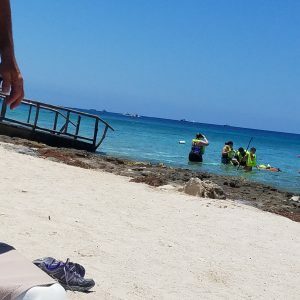 My boyfriend did such a phenomenal job of trying to carry me hundreds of feet down the beach, but we did get some help from fellow beach dwellers to get me into the dangerous part of the water. 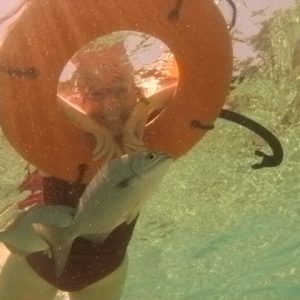 Once I was in the water, and I am somewhat of a fish, I put on my goggles, held onto a life preserver, and was pulled by the snorkeling guide in choppy water for about 45 minutes. 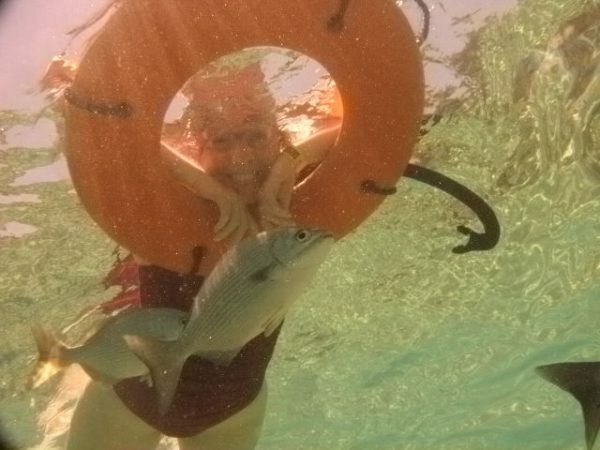 If you are at all scared of the water this probably would not be the trip for you, but I was so keen on trying to participate in activities I did before my accident that I kind of just held on for dear life. While it was definitely an experience I probably would not do this again. 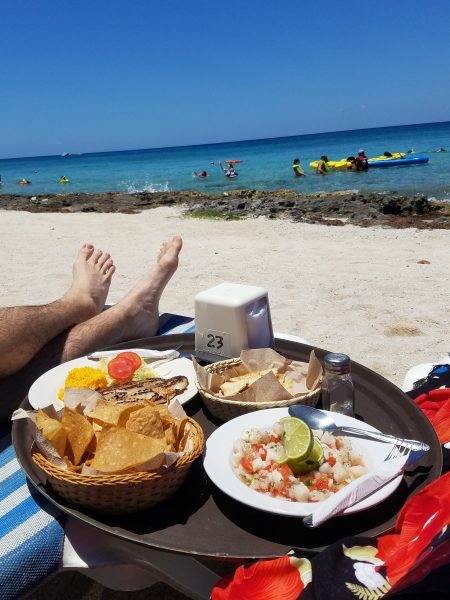 I underestimated at 35 years old the toll being carried up and down the beach, lifted multiple times, inhaling copious amounts of salt water, and bouncing around rough Mexican roads would do to my body. 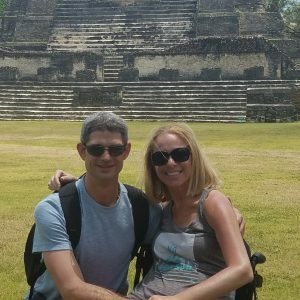 I wouldn’t trade this experience for the world, but I will say these type of off-road adventures for quadriplegics (if you’re not into risk-taking) is probably not the wisest choice! 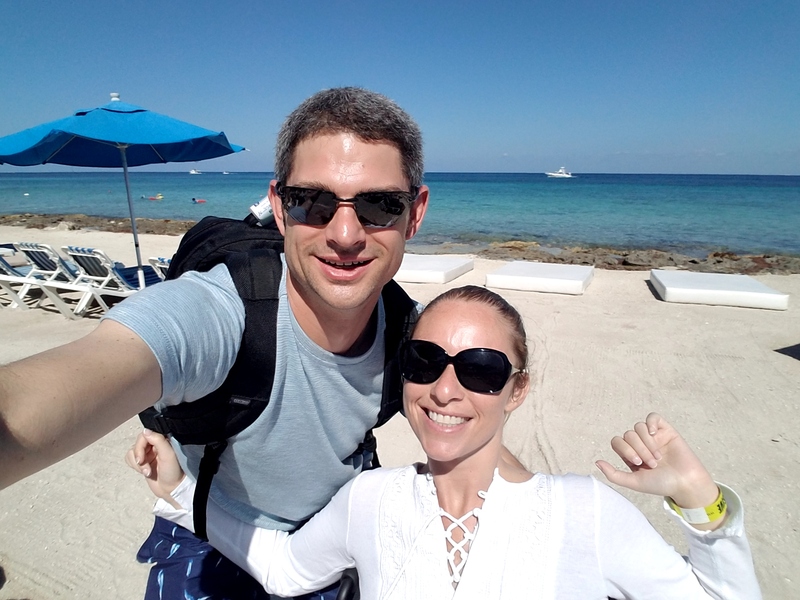 Regardless, we captured some great photographs and managed to finally settle down on some beach chairs with piña colada’s by the end of the day. 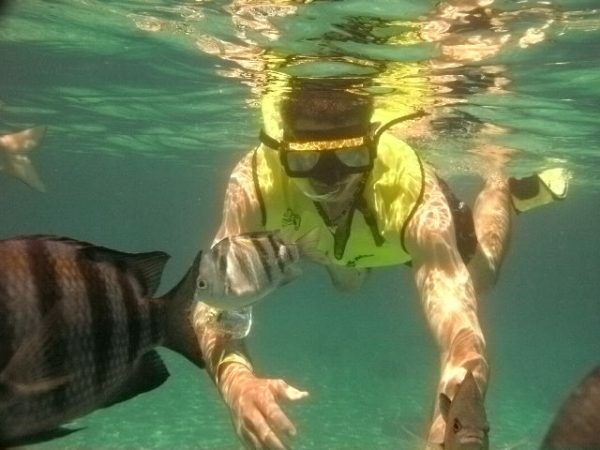 The other notable wild and wacky adventure we went on was in Belize City. 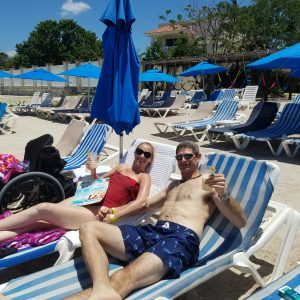 I found a company called Accessible Caribbean Vacations that offers accessible excursions to folks in wheelchairs at the ports where major cruise ships dock at Caribbean locations. 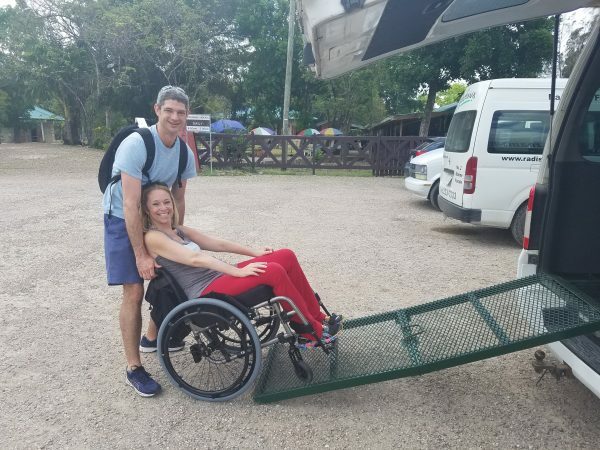 I will say that if you are a paraplegic it would be much easier to participate in these off-road type excursions, but as a quadriplegic you need to make sure that you have someone strong who can ensure your safety, lift you up, and make sure nothing seriously dangerous happens to you! 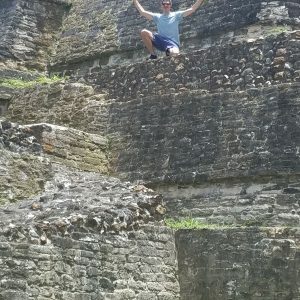 I opted to take a handicap van, and the definition of handicap van in Belize is definitely not for the faint of heart, drive an hour down bumpy roads all to go explore some ancient Mayan ruins. When we got into the van there were no tie downs whatsoever, I could not transfer into a seat, and the roads were not even remotely paved. 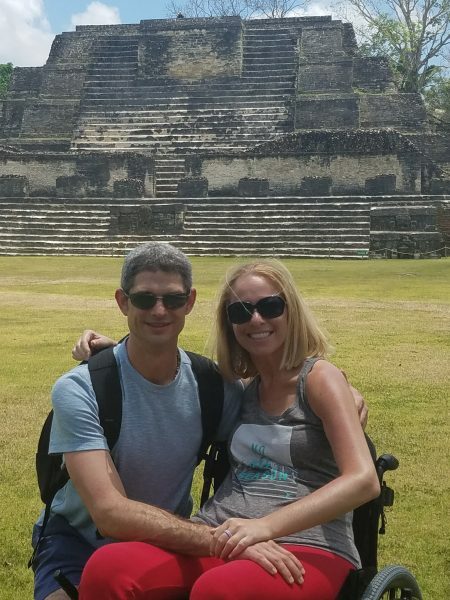 My chair fell backwards, my boyfriend held onto me for dear life, and I sort of laughed & cried for the hour it took us to get to the Mayan ruins. 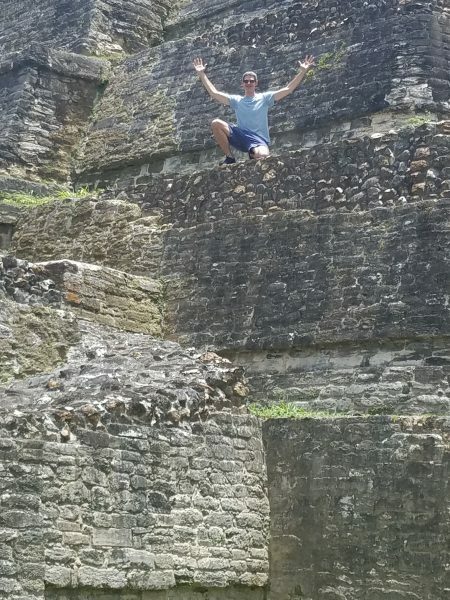 When we finally arrived I was overjoyed to watch my boyfriend climb up these ancient Mayan ruins like a monkey because the look of pure joy in his face was completely worth it even though I was borderline having heatstroke, bouncing around off-road paths, and watching everyone climb up the ruins, but myself. 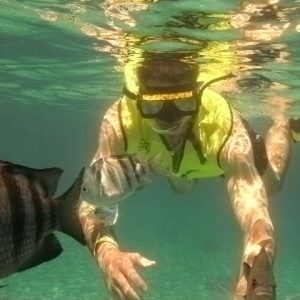 I’ve been to Belize prior to my accident and I think I was trying to compare what I used to do to what I can do now. 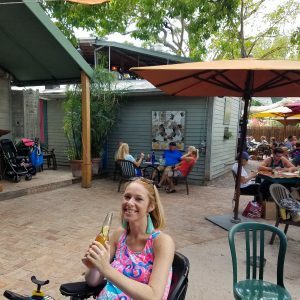 I came to the realization that being paralyzed my definition of fun is definitely starting to change. 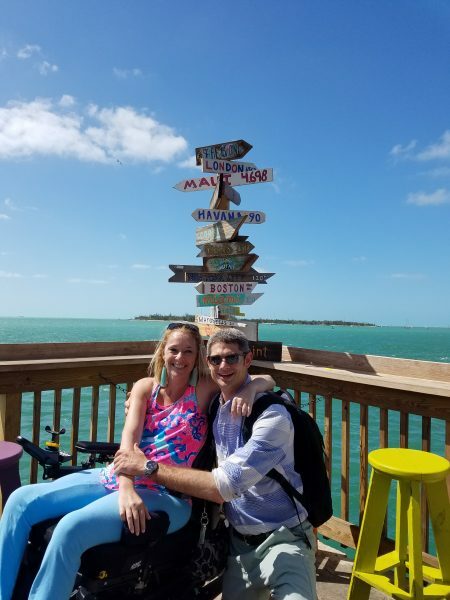 CONCLUSION: If you are a quadriplegic and decide to take a cruise with a power wheelchair only then many of the shore excursions are just not feasible. 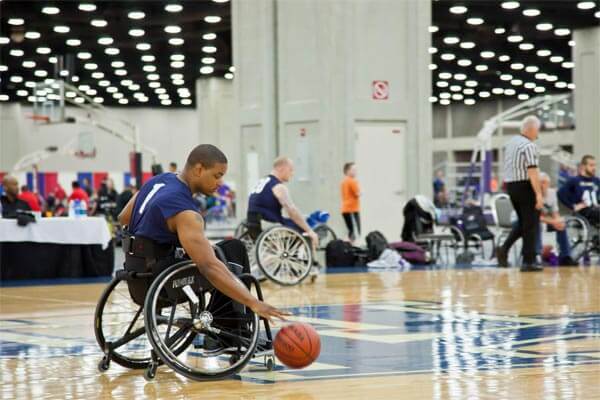 If you are a quadriplegic with a manual chair and you want to take some risks, don’t mind feeling uncomfortable, and are up for some rugged adventure, then, by all means, go for it! 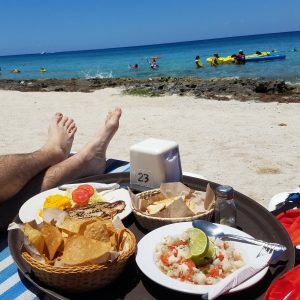 However, as adventurous as I am I have to admit I was pretty nervous on many of our shore excursions with respect to pressure sores, and I actually did get a small one on my tailbone several days into the trip from what I can only think is from lying on towels in a wet bathing suit on the beach chair in Mexico. 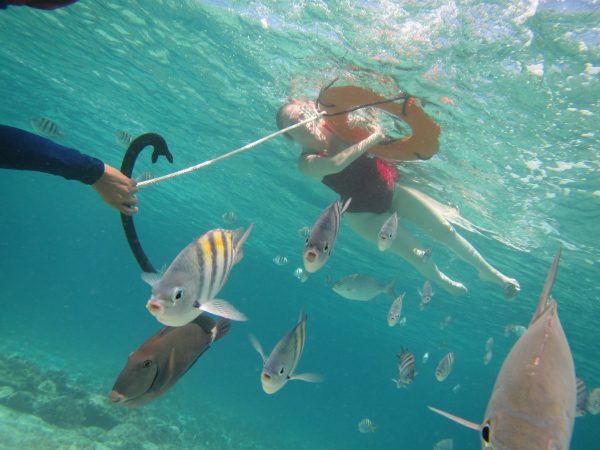 I can’t even begin to recount the waterfall of activities our cruise ship offered every day. There are giant screens all over the ship that tell you what is going on on the cruise ship every hour of the day. It is completely mind blowing. 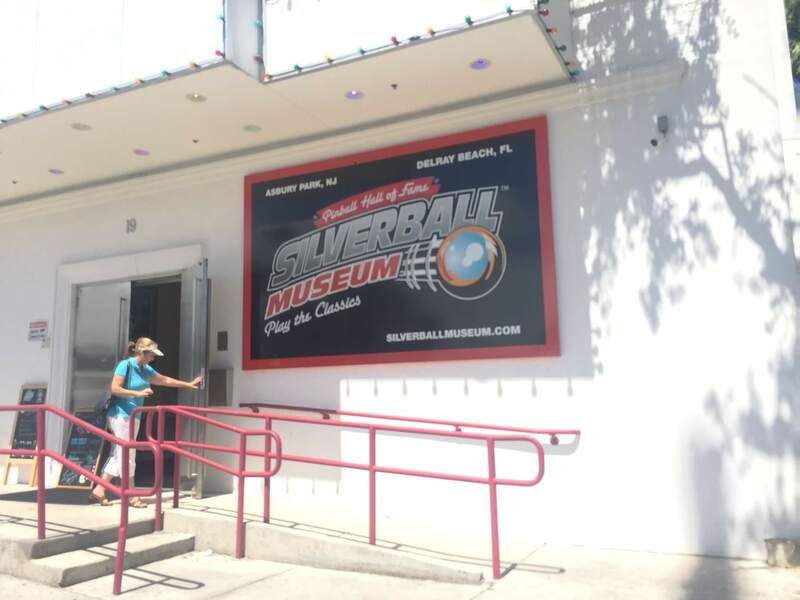 Activities range from ballroom dancing, nutrition classes, fat people belly flop competitions in the pool, tango lessons, bingo, casino specials, classical music bands, dancing, drinking, art shows, shopping specials, etc. I mean the list could literally go on. 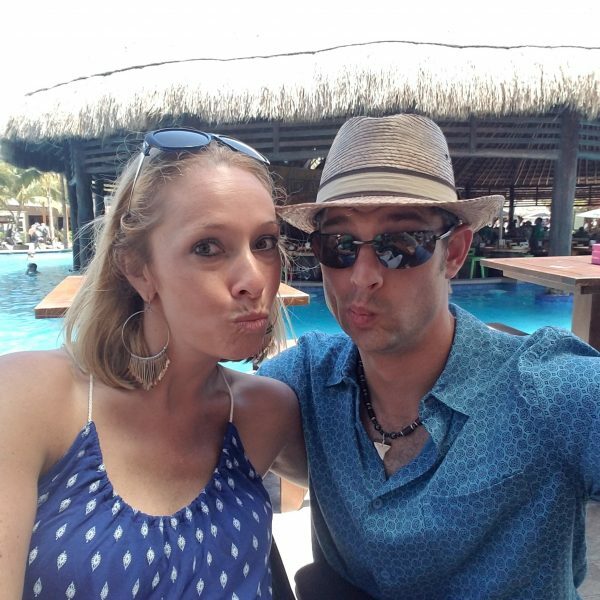 Since my boyfriend and I wanted to participate in several shore excursions we had to get up about 5 AM every morning in order to get the two of us ready by 9 AM sharp. The challenge for shore excursions is that you have to be back on the ship within a certain number of hours otherwise they actually leave you. Therefore, by the time we got back on the ship at 5 PM, showered up, and had a quick bite to eat – it was already 8:30 PM. This did not leave much time to partake in many of the onboard activities as we were so knackered and just needed to sleep. The several days on the ship that we were cruising to destinations we usually slept in a bit, and when we ventured out to explore the ship so many of the activities were so crowded that I just didn’t find it appealing to be around hundreds of people in a small confined space. We did find areas of the ship where we could have a nice cigar, a glass of wine, and watch the ocean role by as the insane amount of shenanigans around the ship happened without us. 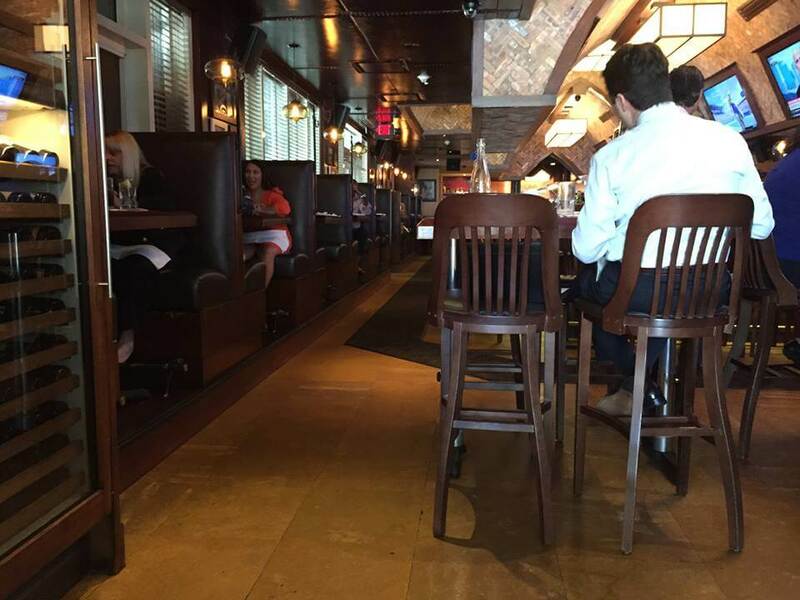 What makes our situation slightly unusual is that we actually enjoy our own company to the point that we don’t like having hundreds of people around us all the time. Honestly, I didn’t understand how much there was to do on a cruise ship until we actually took the cruise. 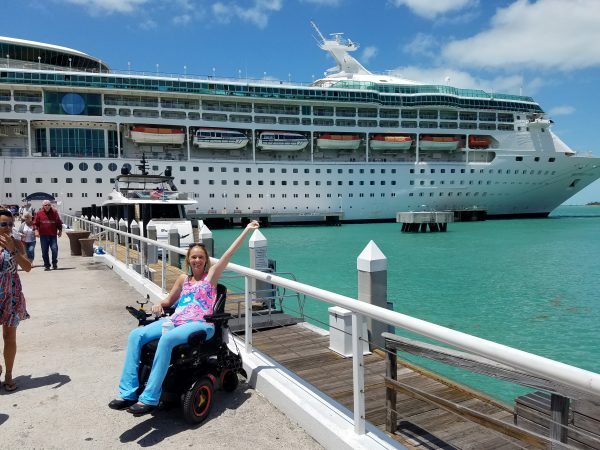 If you are in a wheelchair and you cannot get off the ship and enjoy participating in a lot of activities to stay busy, then taking a cruise is definitely the right choice for you! 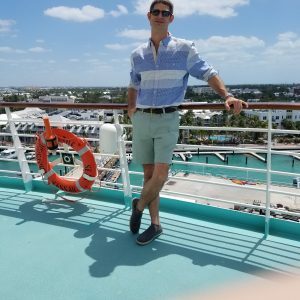 You can always find something to do, there are so many places to eat, and people are pretty friendly around the ship. With respect to the two of us, well, we really just wanted to hang out by ourselves … In hindsight, probably not the wisest choice to take a cruise, but I’m glad we at least tried it once. Now, on to the pool. 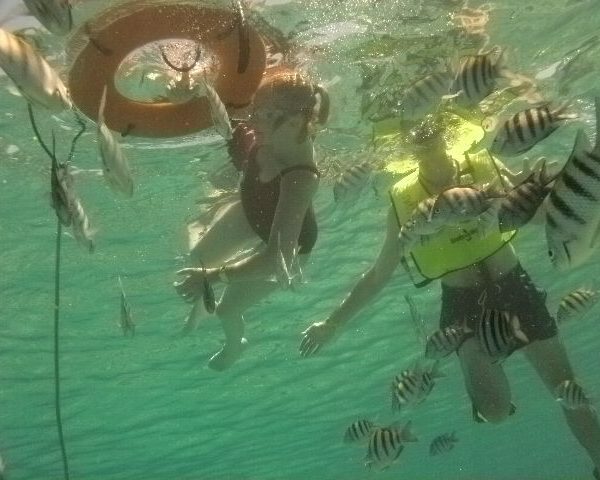 I was pretty excited at the prospect of swimming on the ship, but being that we were on one of the smaller ships there was only one small pool for the whole ship. This made it extremely challenging because the pool was constantly filled with dozens and dozens of people, which did not make it appealing for me to get in the water. Since I swim independently I cannot have a bunch of people hitting me left and right because I cannot keep my head above water. 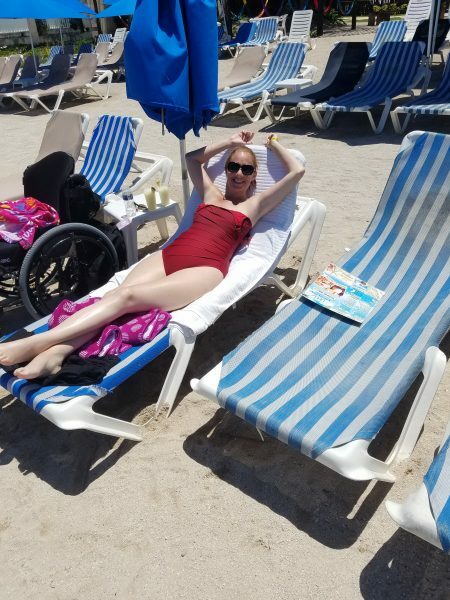 So, unfortunately I decided to forgo swimming, but I have seen other folks in wheelchairs on larger cruise ships definitely dive into the pools. I decided to spend a little bit of extra money to get a Junior Suite with a balcony instead of a regular state room. I needed the extra room for my manual and power chair as well as all of my stuff. We still found the Junior Suite quite cramped and had to move a lot of the furniture out, which the staff were more than happy to help us with. I did not see what a regular size room looked like, but if you are in a power chair I imagine it would be quite challenging to maneuver around in a small room. The roll in showers, however, were really great. 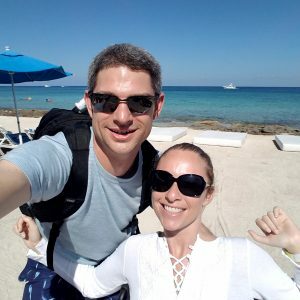 I had my herculean boyfriend lift me up into the shower onto the shower bench, which I actually do not recommend if you are paralyzed from the chest down, but we made it work  I would grab on to him for dear life as he showered me and then he would pick me up like a princess to put me back in bed. It is probably advisable to rent a shower chair or bring your own on these cruise ships. 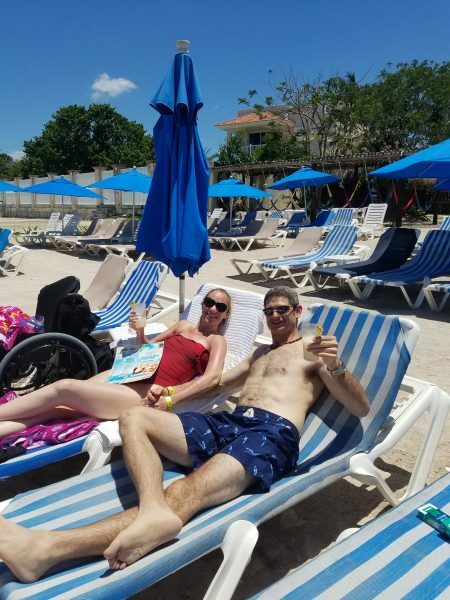 CONCLUSION: If you are in a wheelchair and don’t plan on taking many shore excursions in order to stay on the ship to participate in all of the activities I highly recommend booking your cruise on one of the larger ships that have multiple pools, more decks, and more activities. I personally felt pretty cramped on the small ship with respect to taking part in dancing at night or swimming in the pool. 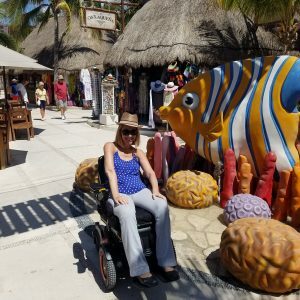 While I am not personally a fan of being on a cruise ship due to the fact that I don’t like to be told how many hours I can go explore something, when I have to be back, and having to rush with the fear of being left behind … I can understand the appeal of cruising for many folks in wheelchairs. 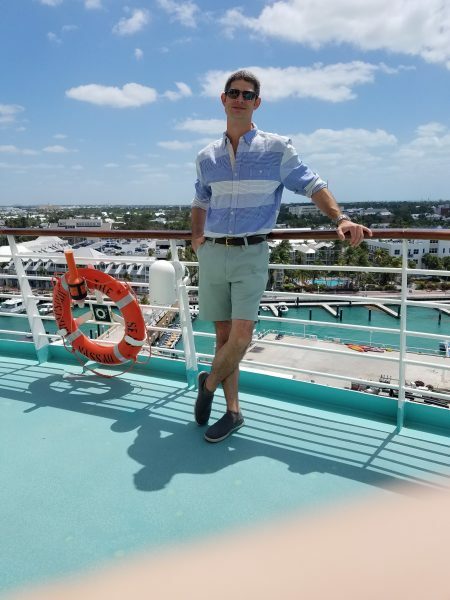 The ships are fabulously accessible, the staff are extremely accommodating, there are activities for all if you stay on the ship, and if you like to just watch the ocean role by it is extremely relaxing. I think our next vacation will probably be to some all-inclusive resort near white sand beaches with a giant zero entry pool where they make fantastic piña colada’s! Hey Buddy!, I found this information for you: "Cruise Ship Adventures & Wheelchairs – Lessons Learned". 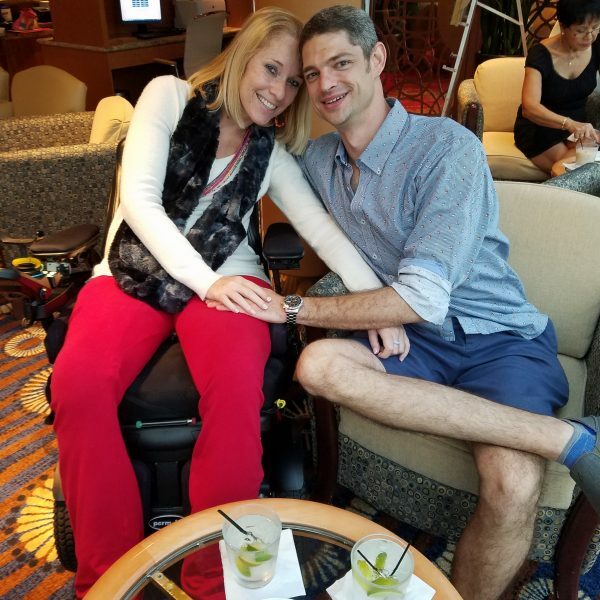 Here is the website link: https://pushliving.com/cruise-ship-adventures-wheelchairs/. Thank you.